Taxi drivers might notice something wrong..
Child Sexual Exploitation is a form of sexual abuse that can affect any child, anytime, anywhere - regardless of their social or ethnic background. Just because a young person receives something they need or desire does not mean that they are not being abused. Taking advantage of this need or desire, and making the young person think they are in control because they are getting something in return, is part of the abusive process. If you are a professional working with children and young people, please take a look at the Child Sexual Exploitation: Definition and Guidance developed by the CSE Knowledge Transfer Partnership NI. With an older person and in a relationship? Going to a hotel, house party or secluded location? If you think something isn’t right – chances are you are right! Here’s how Child Sexual Exploitation can affect young people. 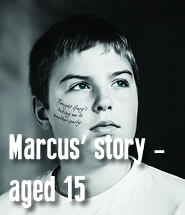 Read Beth, Cassie and Marcus’ story.